First of all, our reputation is an essential part of who we are and what we do. At Bebirian Rugs, we take pride in serving our customers to the best of our ability. Our business would not be where it is without our customers. We know that the many loyal patrons, in the local community help us be a great company. They return year after year which means we must be doing something right. The five star reviews our valued customers leave really give you a feeling of the connection our crews give the home and business owners in the area. Click here to see the reviews of our company. These five-star reviews are from satisfied customers like the one below. Leave one of your own if you have not done so already! 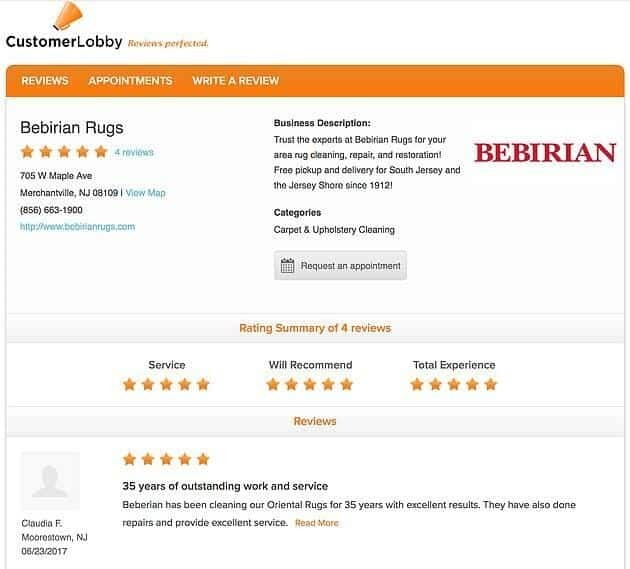 Trust the experts at Bebirian Rugs for your area rug cleaning, repair, and restoration! Free pickup and delivery for South Jersey and the Jersey Shore since 1912!